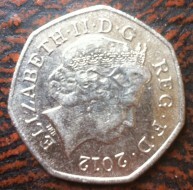 We live in a nation of train fare hikes. It’s all to do with something really boring called RPI (retail price index) – which adjusts the prices of stuff we buy to reflect inflation every year. Last time I checked, RPI was +1% (apparently) but in some places went up by as much as +14% due to some ridiculous loophole. The fare I buy most often (London to Bristol) went up by so much I now travel by coach between Bristol and London, to my dismay. So if you were one of the many people who were caught out – by a fiver or more added when purchasing your ticket on the day of travel – you are not alone. The first way to avoid getting stuck, is to buy your ticket in advance. I know this is a pain in the arse. But even if you book 24 hours in advance you will still likely save money. In India, fares are released 120 days in advance and get booked up pretty quickly – no walk up fares unless you get Tatkal (emergency) tickets – so for now, we may need to look at changing our mindset to one where we just accept that we need to plan ahead. I always buy my train tickets online and from the company that operates the train on the route I am travelling on. First Great Western, in the case of the Bristol to London journey. I even book my train ticket online from my phone if I am at the station, rather than from the counter, and pick it up from one of the fast ticket machines. Try and book a week or more in advance if you can. Britain has the cheapest advance fares in Europe. When all those companies say things like ‘save up to 80% on train fares’ what they are actually saying is, buy in advance and the standard fares are up to 80% cheaper than they would be if you purchased your ticket on the day of travel. Another way is to split your tickets. This means that you buy tickets per segment of your journey, instead of just the one ticket to cover them all. If you are leaving at a peak time – before 10am or after 4pm, to be on the safe side – buy a ticket that covers the part of your journey up until 10am, then change trains at 10.01am or after (off peak) and carry on with a ticket that covers the rest of your journey. If you buy two tickets for the same journey on the same train, the train you are travelling on must stop at the station you are splitting the ticket at. This means that in some circumstances, you can’t stay on the same train with your two tickets and would be staying on the train at your own risk. Always check the route. If you are travelling on a route with more than one train operating company, check the websites for each one. The operators have different fare structures – It may be that the part of your journey with Virgin will be more or less expensive with the part of your journey with First Great Western. If there is a group of you travelling, always check to see if the train operator provides group travel discounts. You will find more information about these on the website of whichever operator operates the trains on the line you are travelling on. My most regular route, as previously mentioned, is Bristol to London, operated by First Great Western. The group travel discount is called Groupsave. Yet another way to save money is to get a railcard. Railcards save you 30% on off-peak fares. Sadly I’m no longer 25 or younger, so the 16-25 railcard is off my list. I’m not 60+ either, so I cannot purchase a senior railcard. I have not produced a family so far, so I won’t be getting a Family & Friends Railcard. 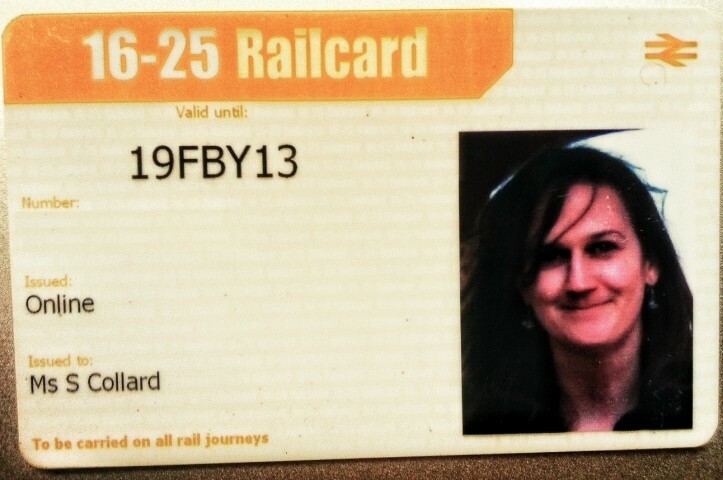 Hurrah, everyone can get a Network railcard so I’ll have one of those bad boys. The Network rail area covers routes out of London, to a point. On my London to Bristol route, for example, the area extends to Reading. This means I could potentially buy a ticket to Reading with my card then change to the standard fare from Reading to Bristol. 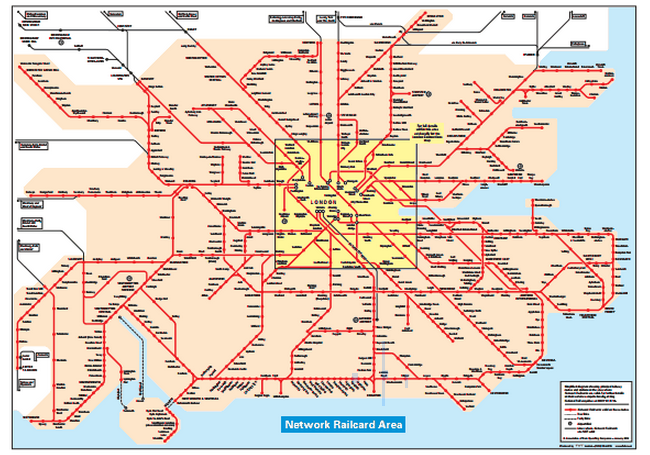 The Network Rail area map can be found here. To Purchase a Network Railcard, you will need to download the application form, fill it in, and take it to a train station ticket hall with your recognised form of ID and photo, or pick up a form at the station and do it all there. Use your common sense when working out which card you are eligible for and when to use it. The 16-25 Railcard, Senior Railcard and Family & Friends Railcard can be used on all off-peak journeys that are not exclusively within the Network Rail Area – for which you would use a Network Railcard. It is SO worth having one. You’ll save the amount you spent on the card in just a few journeys.